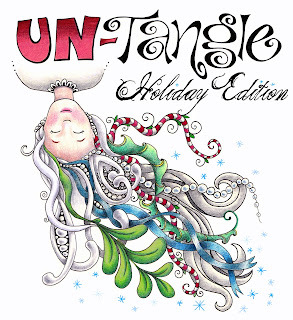 Here are the details for the UN-Tangle retreat in November - just in case you have forgotten. No - I am NOT trying to rub it in your face, I wanted to remind you that you can save $75 off your room price if you register by September 1st. And that deadline is coming up FAST! The Patchwork Pearl and Sandy Steen Bartholomew have been working on a follow up to the original UnTangle retreat in March, and we're delighted to be able to announce what we have planned. The Beachmere called - they want us to ring in the holidays with them - so we hope that you'll join us on Friday, November 9th for a weekend of fun and Tangling - all with a holiday theme. We're planning a weekend of workshops and hands on experiences for you, with an added twist of helping you with your Holiday gift list. If you have something in mind to Tangle, bring it with you to work on it. One change we are making is that we're sizing the retreat to give each of you more room to spread out. Please make your reservations today - and take advantage of the Early Bird pricing at the same time - to make sure you get a chance to come play with us. - book by Sept 1 and save $75.00 on your registration. (which includes the workshop fee of $250). We hope to have as much fun as we did the first time, so please book your reservation today. AND - since I keep getting emails about this - - NO, you don't need to be an artist or a CZT to attend this retreat. YES, complete newbies are very welcome. And YES, Linda will match you up with a roommate if would like to share a room. YES, you can bring your spouse. NO, they don't have to take the workshop. 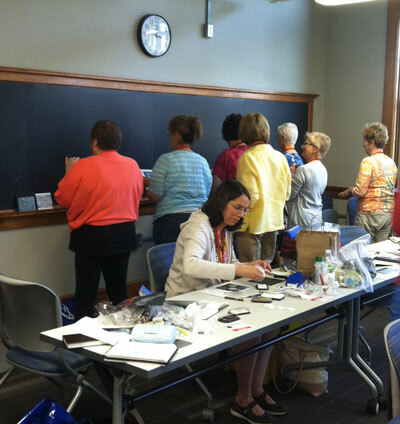 NO, this is not a high-powered, stressed out super-workshop. YES, it is a fun, relaxing, easy-going, safe-place to let your hair down, be yourself, try stuff out, and laugh a lot. Introverts AND extroverts will enjoy it! I wanted to remind any of you Certified Zentangle Teachers who were planning on attending the 2nd Annual CZT Retreat here in NH - that today is the deadline for getting $75 off your reservation! 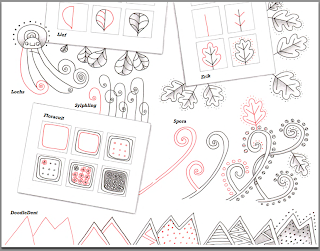 Sakura and Zentangle have teamed up recently to release special Micron pens and tile kits. And just today, Leslie Crumpler, who works for Sakura and is a Certified Zentangle Teacher, released a really fun teaser video! 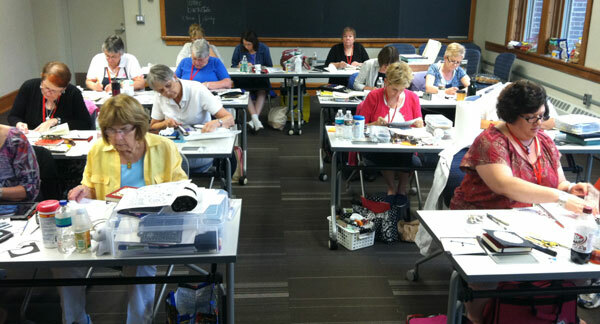 The video features CZTs and their students working on Zentangle tiles (and using Sakura products). It also features some really adorable kids (like Molly Hollibaugh's daughter) and my little angels. hee hee. You can see my kids... Lilah is drawing from 0:58 to 1:11 and Alex is tangling from 2:14 to 2:25. 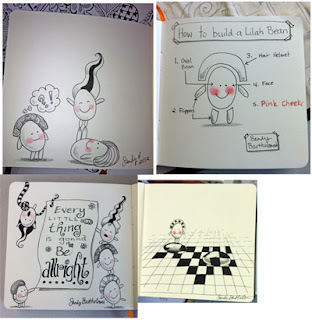 Both my kids are using Zentangle for Kidz! as inspiration. :-) And you can see Lilo Bean, the cat, sitting on the bench next to Alex. She is in the book too - but she doesn't tangle. If you read all the way through my last post about the Minnesota trip, you saw the mention of my new ebook? 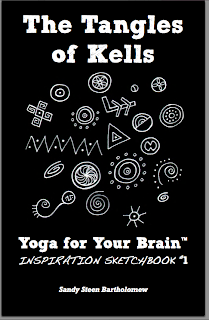 I had been working on Yoga for Your Brain™ Inspiration Sketchbook #1 - The Tangles of Kells for a couple of months before the trip. But when I saw that the Saturday night movie at the retreat was scheduled to be "The Secret of Kells"... oh - boy that actually gave me a deadline to finish it up!! I wanted to be able to give copies of The Tangles of Kells to all my students. In real life, The Book of Kells is a fabulous, super-fancy-decorated illuminated manuscript with impossibly ornate designs. Not at all in the Zentangle tradition (as far as easy to draw, "one stroke at a time" etc.) The patterns and the Celtic knots and little creatures and people took talented scribes ages to draw and paint. 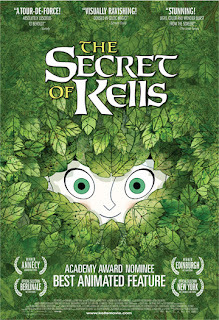 The movie, The Secret of Kells, was nominated for an Academy Award. It is an animated tale "about the power of imagination and faith to carry humanity through dark times." You can see some of the gorgeous artwork on Flickr. And I just found out there is a graphic novel available for the iPad! 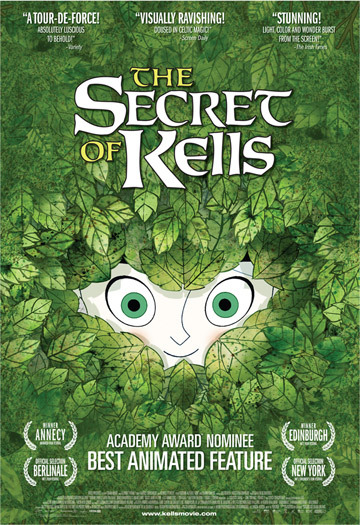 You can rent the movie on Netflix or buy your own copy of The Secret of Kells on Amazon . I did both. I had watched it so many times with my daughter and then finally bought a copy so I could stop the scenes and draw the doodles and tangles. But seeing it on the big screen at the retreat was just spell-binding. The room was absolutely silent and I think most of us had our jaws hanging open. It is very hard to describe the beauty of the scenes. The animators are from many different European countries and have injected their own flavors and styles into the movie. The animation is flowing and luscious, not at all like the rigid contained images of an illuminated manuscript. And when it snows - the snowflakes are Celtic knots!! Of course. Seriously, you just need to watch it for yourself. This movie inspires me. So I created a little ebook to show some of that inspiration. The book is just under 30 pages. Yes, I know the pdf will tell you it is 16 pages, but the pdf reader is seeing each two page spread as one page. It is a little book, but has a lot of stuff in it. Kind of seems to be how I roll. My books are small but packed. I did learn a lot in the process - and I have had a ton of comments from people who bought the book over the weekend. The covers are black, and yes, they use a lot of ink to print. I didn't design them for print, but for the iPad. I like the look of the little Moleskine journals that I usually draw in - and my original AlphaTangle book. Black covers. If you are printing the book, you might want to NOT print the back cover. And use landscape orientation - print "sideways". Each two page spread will fit on one regular piece of paper this way. When I printed my own copy of the book, I used my color laser printer and only printed on one side of each sheet. 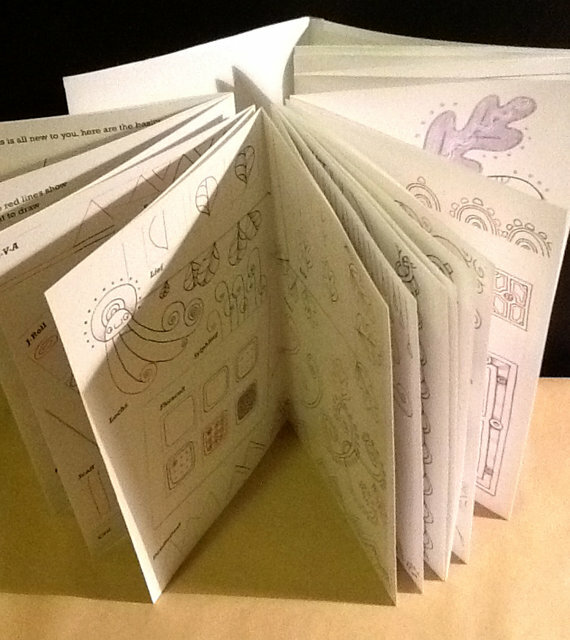 I folded each sheet in half and glued the backs of each page together, but only along the front edge. I folded the covers in a similar way, with the extra, blank part forming a flap inside the book... and some Japanese tape as the binding. I can open the book like an accordion and see all the pages at once. Other people have told me that they are spiral binding their copies. Or just sticking the pages in a binder. A few people have told me to put the book on Amazon or Lulu.com. And a few more have asked why it is not available as a printed book. Sigh. Let's just say it's an experiment. And I hope you enjoy it. If you folks like this little ebook, I have ideas for others that I would like to do! Sandra Strait did a review of the The Tangles of Kells on her blog today. She is incredibly thorough and very honest - plus she makes the most incredible "samples" to test out my tangles! 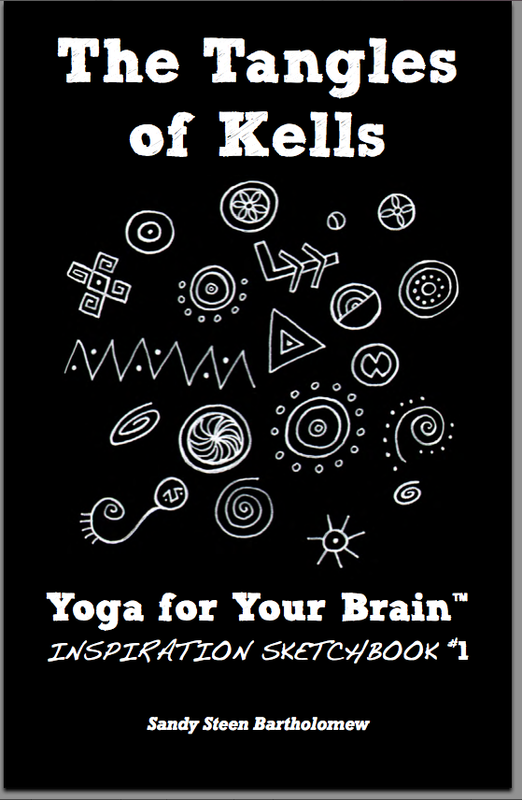 You can order the The Tangles of Kells in my Etsy Shop or from my website. The website is more immediate, as soon as you pay, the shop will send you an email with the link to download your copy. If you order through Etsy, you will have to wait until I check MY email and then send you a link. I am quite a bit slower than a computer! 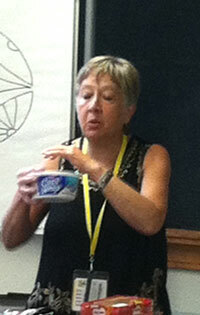 Joyce Francis, looks like a seance involving a tub of Cool Whip...?! Strange image - looks like everyone is having a "time-out", "face the wall and think about what you have done." Actually... that is pretty accurate. They are all putting their work along the chalk-tray for a mini exhibit! My amazing students hard at work. 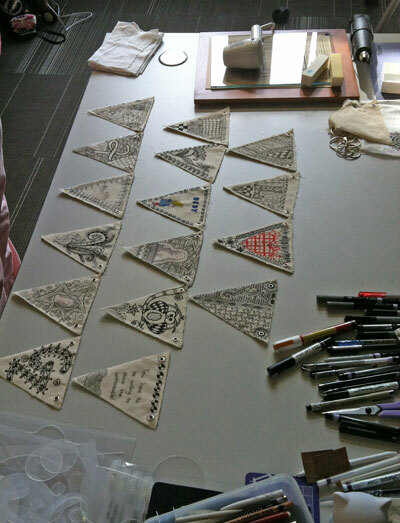 ...so I requested right back at 'em, that they each tangle a mini banner for me! 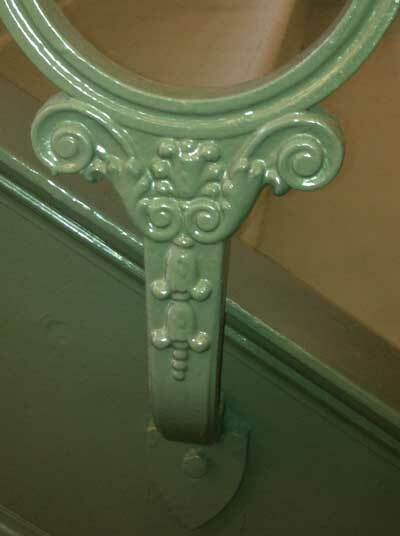 The building had some very intriguing architectural details. This railing part looks like a bug! 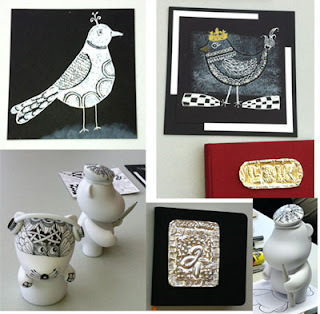 Some of my students' work. They did incredible things with whatever I threw at them. 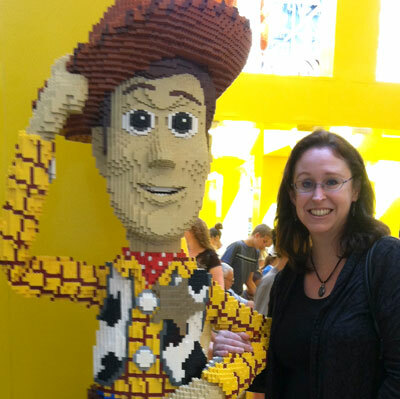 And a Lego Woody! Joyce makes friends quickly. She called her son from the store, "Guess where I am!?" I have been home for... three days(?) and I am still exhausted. But that was the BEST teaching gig I have ever had. 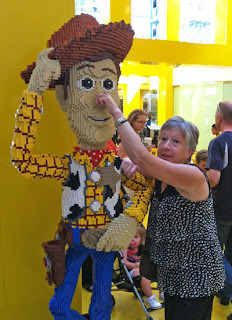 And it wasn't just the Lego chaser! I learned a lot from my students and my fellow teachers, I just have to process it all and get myself to DO something with everything swishing around in my head. I did make a small start and got my new ebook posted on my Etsy store. I still can't get over the coincidence... I had been working on an ebook about the tangles in the movie, "The Secret of Kells" and guess what they showed on Saturday night at the retreat?! Guess!? That movie is truly mesmerizing on a big screen. I should write more about it - and everything - another day. Rest! BTW - I posted the group shot on Facebook, so please be sure to tag yourself if you are in the picture!